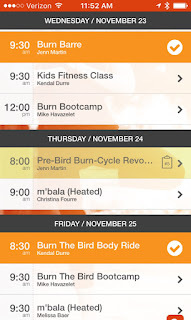 The Zinn Life: Beasting Thanksgiving: Keeping Up Your Fitness Goals So You Can Eat All the Things! 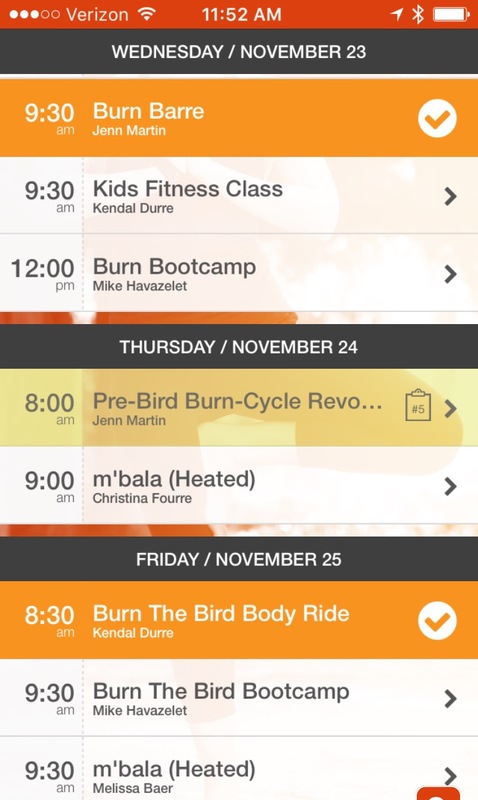 Beasting Thanksgiving: Keeping Up Your Fitness Goals So You Can Eat All the Things! Thursday is the day. The day I dream about starting in June. Thanksgiving. You're probably tired of reading about my deep love of Thanksgiving, but this is the last blog about it for a while since we'll be moving immediately into Christmas after tomorrow. Heck, most people are already there! Poor little Thanksgiving gets left behind by most, but me! I love this day because it's all about my two favorite things: food and family. Both can be a little tricky though: not enough and you want more, too much and you're in pain! When I thought about this post, it started off as "how to not over-indulge" but let's be real. That is the point of Thanksgiving. I'm certainly going to over-indulge. It's like the one day out of the year that you can eat everything, be as gluttonous as you want and no one will judge you. You can choose to eat five pies and no vegetables and it is okay! So this post isn't about how to not over-indulge, it's about making sure that you can and not feel bad about it! Here are four ideas to help you get your workout on so you can eat what you want and not undo all the good you've done! When I was in college, this meant drink all the alcohol before you got to the bar so you didn't have to spend as much money (sorry mom). Adult pre-gaming for Thanksgiving now means getting all the workouts in before the big day, cause now I drink all my alcohol at home. I guess that means I now just game? This week, I did a class Monday night, will do two classes tonight and I have one scheduled for Wednesday morning! Get all of your normal workouts in before the big day and maybe add an extra just for good measure. My schedule at Burn for the next three days! Getting in your normal classes before the big day is important, but some places are open on the day of Thanksgiving. My gym, for example, has two classes that morning. They are early, which allows you to get in, burn some calories, and get back home before anyone misses you! Make sure you are extra nice to your gym people that day! We all know that Thanksgiving takes forever to prepare and only 10 minutes to eat. Instead of sitting in a chair and watching football all day or napping after the meal, maybe head outside together! Play some football or take a family walk. Growing up, when we went down to my mom's sister's house for Thanksgiving, we always took a walk around the property after lunch. It was a good way to spend some time together and helped us not feel as disgusting as we did. I love Black Friday. It is the ultimate in shopping olympics. The deals, the crazy people! If you normally shop on Black Friday, make sure you wear your fitness tracker or use an app on your phone to track your steps. Make it a goal to get 10,000 steps that day! That might mean parking as far out as possible. Maybe not moving your car from lot to lot. Find some ways to make that crazy shopping day work off some of that food you downed the day before. You're already going to be out, so make use of it! Thanksgiving is just the beginning of a month of eating really wonderful but terrible for you things. We already have five Christmas parties on the calendar and it's not even December yet. And that doesn't even include time with our families! Even if you don't do anything over Thanksgiving, make sure you get right back on the exercise wagon. Get back in the gym, get back to walking or running or lifting weights. I told Aaron my goal for this month was not to lose weight, but to not gain any. Between my birthday and Thanksgiving, I know that's going to be hard. December is going to be even worse. It's a super busy time of the year and you need to make time for yourself. Make you a priority. The hardest part of the gym, or exercising in general, is just doing it. You can make it through 45 minutes or an hour as long as you get there. 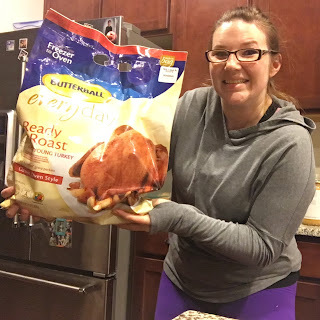 Me and my 12 lb turkey before class Monday night! We're hosting, so tomorrow is my cooking day and I have two classes tonight. My goal is to get 10,000 steps in today and tomorrow between my class and all my time in the kitchen! What are your goals for Thanksgiving? Are you going to try and work out before or do damage control after? Or are you crazy like me and going to work out every day possible? Great tips! I have started doing a little Black Friday shopping after dinner to get some exercise and honestly just not eating as much too. My goal for thanksgiving is to get through it.